Chris Silva and I recently published a research note, along with a few case studies on how organizations can use EMM capabilities to go beyond management and security of mobile devices. This blog post is not supposed to be an abstract of that note, but to provoke readers on how to exploit the capabilities of a key technology to its fullest potential. Both as EMM providers and EMM users. 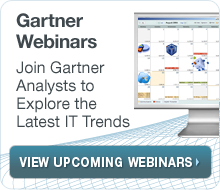 EMM is the most underutilized tool in the IT toolbox. EMM is the most underutilized tool in the IT toolbox. I say this with great agony. Having seen the evolution of EMM from its MDM days and its future as UEM, I personally think that the current state of EMM is unfortunately due to its origins as a device ‘management’ utility. It is one of those accidents in history where MDM shot to fame to manage the onslaught of Apple devices in the enterprise, but never went on to realize what it is actually capable of. It remained enslaved forever to the APIs exposed by the underlying operating system or proprietary OEM APIs to enable slightly advanced use cases. The perception that EMM is nothing more than a tool to manage policies on mobile devices is deep-rooted in the IT psyche. I would argue that using EMM for policy management alone is akin to buying a Ferrari only to visit the local supermarket once a week. I make this claim from the viewpoint of a software innovator. If EMM providers wait for demand generation and organizations end up waiting for features in the product, innovation gets caught up in this cycle where we are not doing justice to the latent potential. Customers in general expect less from EMM tools than what they are actually capable of delivering. 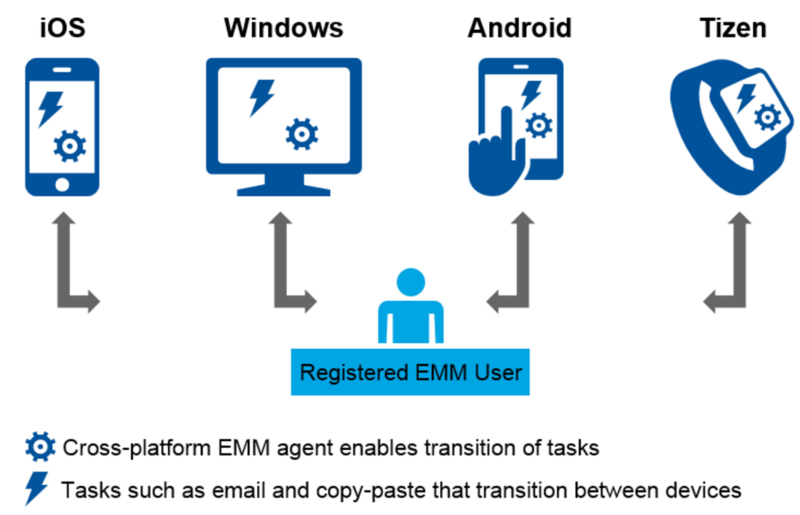 Case in point: EMM “agents” are uniquely positioned to enable the transition of tasks across device platforms. But we don’t see EMM tools delivering these capabilities yet. Microsoft, Google and Apple are building proprietary interfaces that provide contextual authentication and continuity of actions between devices within their own ecosystem. On Apple devices for instance, Handoff and Continuity between iOS and Mac OS enable actions that seamlessly transition a task from one device to another. EMM tools can extend the benefits of similar capabilities to platforms that don’t support it yet and provide a platform-agnostic way to manage business continuity. 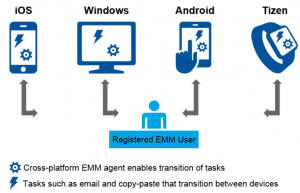 EMM agents on managed devices can enable the contextual transition of activities by detecting proximity between devices registered with the same user. Organizations must view EMM as a must-have tool to enable digital transformation, not merely as a tool to wrap policies around corporate email delivery. 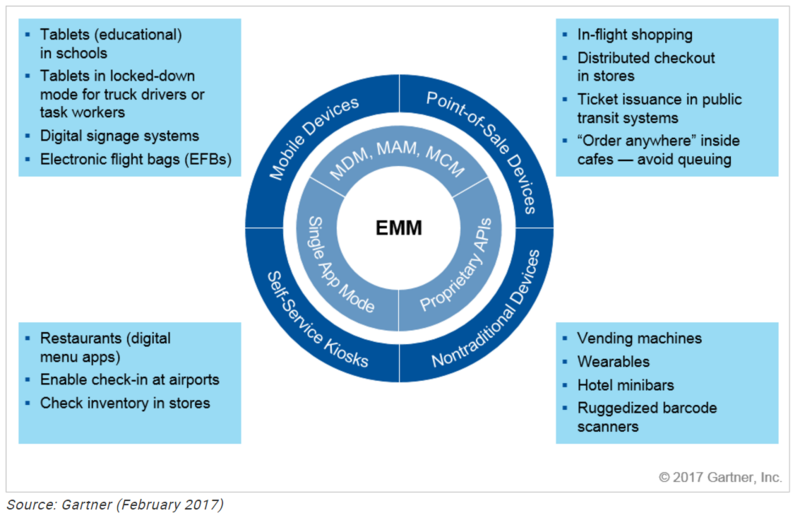 As organizations go from mere digitization of their business workflows to digitalization of their entire business model, EMM should be used to deliver an ubiquitous digital experience for employees and customers alike. Mobile endpoints are largely the front end of the digital experience for the customer and probably will become the only experience of your customer service – and so, it is imperative that we unlock the complete capabilities of this technology. Like I mention in our research, mobile apps running on smartphones and tablets need not be the only interface between you and your customer. It is just one of the many. And it may not even be the ideal interface in many cases. When we take “digital to the core”, every connected device becomes an interface that we can interact with. 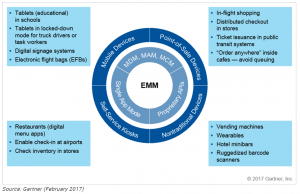 EMM should go from being the “glue” or “plumbing layer” to becoming a foundational “intelligence layer” underpinning all digital interactions. 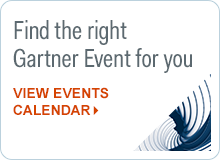 Extract the pearls of “insights” from the oyster of “data” stockpiled within EMM systems. Chris and I are working on how organizations can extract the “pearls” of insights from the “oyster” of data stockpiled within EMM systems. Organizations are already using EMM data for analyzing asset utilization, app allocations, data usage optimization – but we have just scratched the surface. EMM has all the ingredients of a ‘Decision support system’. But the larger issues of user data privacy take precedence and will play a bigger role in the days ahead. The new ‘tug of war’ is not between security and user convenience, but between users’ need for a contextually relevant user experience and their own data privacy. Sadly, this battle can be won only through tradeoffs – inevitably leading to sub-optimal solutions.